Oh my isn’t this the most ROCKIN’ creation! I love the way you used the circles, and the box is genius! And it’s all topped off with that adorable ruffled sentiment. FABU! Awesome project! Love the design, the colors… TFS! Oh my word Mary Jo! You are such a genius! 😀 The box top works as the card too??? How cool is that! You are too creative girl! Congrats on your new big adventure by the way! How excited you must be! You deserve it though! First of all MJ – what a terrific take on the sketch to spell out bday, but WOW – the box idea is over the top! Love it!!! How fabulous is this, Mary Jo! I LOVE it! Holy cow! This is amazing! As usual! Wow! Love this! What a great project for Taylor’s sketch! Beautiful project! Love the paper you used and the spin you put on Taylor’s sketch! Do you have a link to the directions for the technique you used to make the box? Thanks for sharing your neat project!! Ooh Mary Jo…that is a great idea…love the lettering on the top…a great little package. This is just beautiful. The red flower and the center just pops! WOW!! This looks terrific. 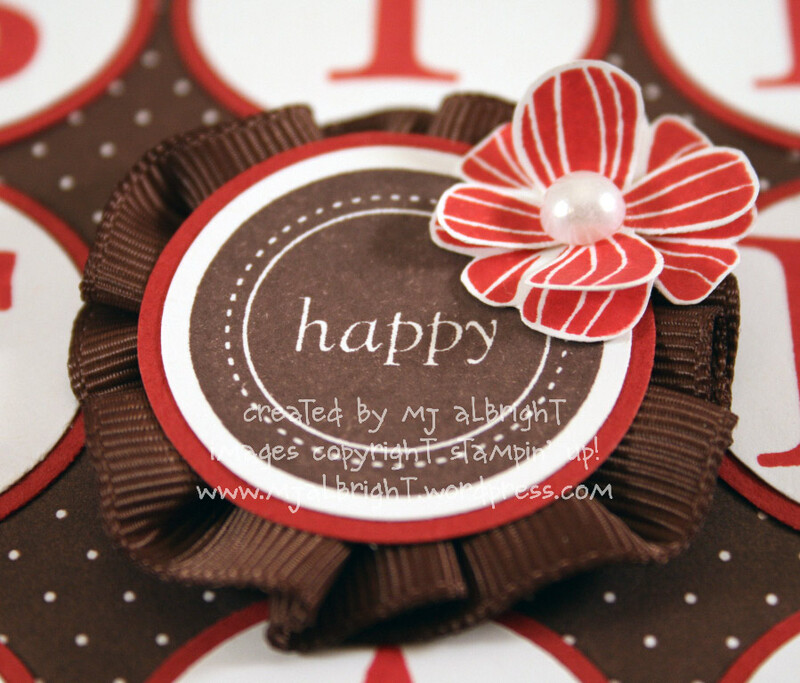 Love the idea of using letters in the circles and without the flower would make a great male card front. Thanks for the inspiration and for sharing. Holy Smokes!! What an amazing creation!! I just love the big birthday letters, and that ribbon in the middle. And that box… Whoa!!! Way cool! what a great treat box! and what an inspiring challenge. I’ll make my way back to Taylored Expressions to find some more ideas! Thanks!!! LOVE everything about your project — so cute!!!! What a great project. 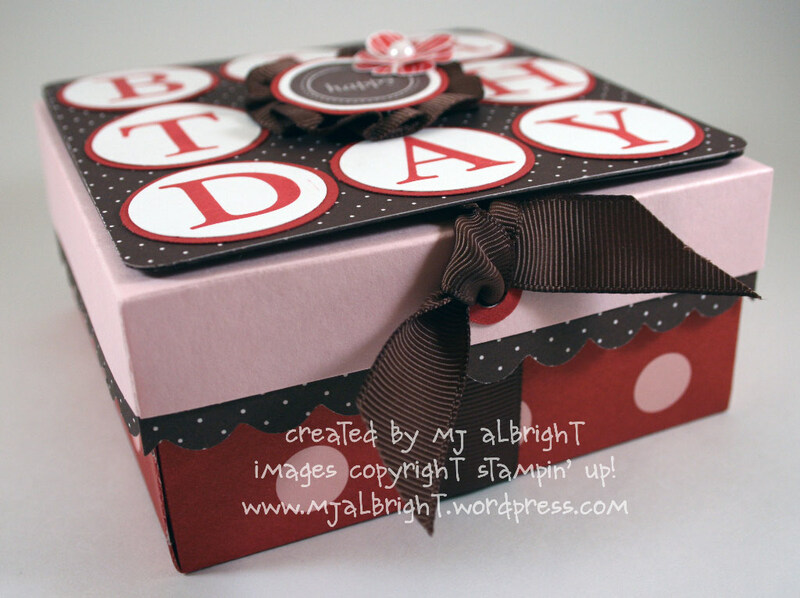 I love the colors, the way you used birthday and I really love that the top of the box is like a card. Wow! This is incredible! 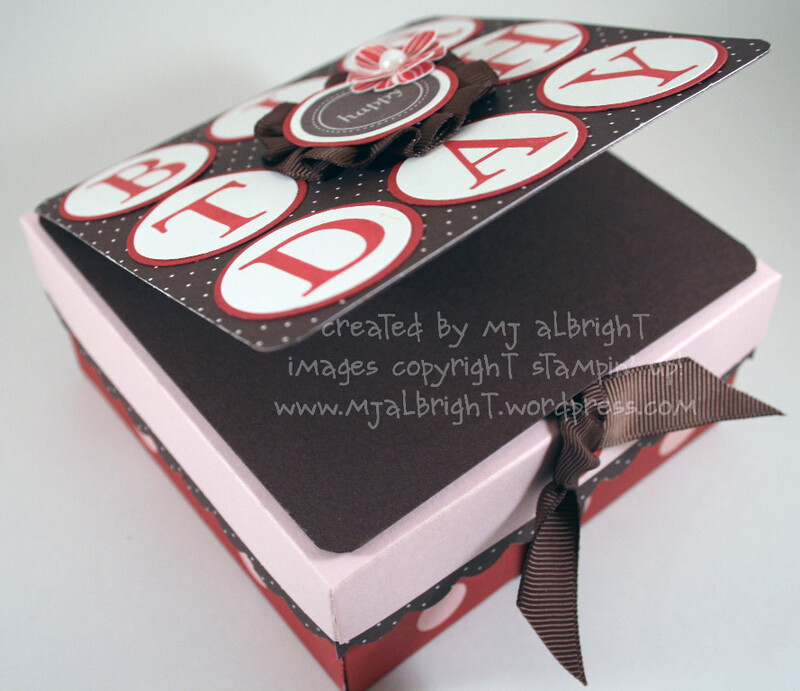 Will you over directions for your box/card combo? Love the double flower and the ribbon flower! Absolutely lovely!! Wish it was my bday 😉 Thanks for the inspiration! Wow, great job with the sketch! Your blog is fantastic and I love your bubbly words and projects. SU must be so psyched to have you on their team. I knew it was just a matter of time though. :+) I am so glad to hear you are focusing on your business side of SU too and having more shows. I saw what you did at my dhow and was so pleased. Not only did I get a ton of free stuff, I had a BLAST too!! To whomever is reading this if you can have a show with MJ, DO IT! It is fun and the FREE stuff rocks!!! Especially in time for halloween, they are one of my favorite cards. If you’re far away then have an email or book party! They rock too. Love this…what a great take on Taylor’s sketch! Oh this turned out totally CUTE! Love it! So creative! My friend Cat has been here from Maine, and just headed back home today..so I’m just now getting around to my blog hop. Mary Jo, I just love this box! The card worked in as the cover just adds that special touch! I gave you a special “shout out” over at CardoftheWeek.com. You can see the original post here: http://www.cardoftheweek.com/2008/08/card-of-the-w-3.html. WOWIE on an amazing creation! The colors just make it fantastic! Good job and congrats on that shout out from Card of the Week! 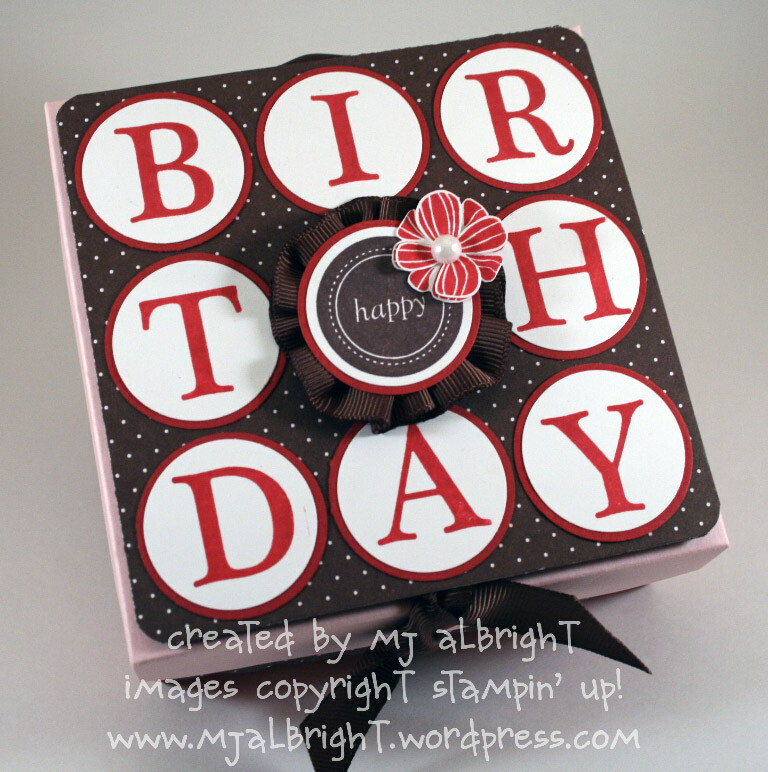 What an incredibly creative project…………love the birthday card and gift box-in-one idea. Beautifully done! I am continually in awe of your creative talent!!! Thank you for sharing 🙂 This will be such a useful project for all the birthdays to come.